Hey there Fabulouses! Got a cabana you can do some lounging in? MOoH! is setting you up with the perfect little romper for such an event, priced at just 1L for The Beach Bunny Hunt! This sweet little romper comes in a ton of mesh and mesh body sizes as listed below and also includes a texture change HUD with 6 colour options! If you need a little help, you can click the hint giver at the landing point, and the hunt icon you are searching for is a blue beach pail. Good luck and happy hunting! Categories: all-in-one outfit, dollarbie (1L-3L), hunts, mesh, pants, shirt | Tags: 1L hunt, Adele, Alaskametro, c88, Catwa, Collabor88, dollarbie sl, Doux, fab free, fabfree, fabulously free in SL, Glam Affair, hunt SL, Ikon, Love Trill, maitreya, Mandala, MOoh, Second Life, second life hunt, sl, TBBH, The Beached Bunny Hunt | Permalink. I’m standing in my kitchen, and wondering who put this pile of donuts and these sugar cookies here. Why? Why! I want to eat every single last morsel, BUT I shall be good. I’ve got my reasons, like wanting to fit into this super adorable and sweet dollarbie dress from No Cabide! I am pushing all thoughts of sweet treats from my mind and focusing on how cute this little dress is! I do enjoy anything dappled with hearts, and this dress just makes me smile. You can grab it for a measly little Linden on the SL Marketplace from No Cabide! Cute! I just remembered….I can eat anything I want in SL and not gain any weight! Categories: dollarbie (1L-3L), dress, Marketplace | Tags: 1L, Aline Passiflora, dollarbie, dollarbie sl, dress, Dust Bunny, fab free, fabulously free, free, freebies, hearts, Marketplace, minidress, No Cabide, Second Life, Second Life Free, Second Life Freebies, sl, sl fashion, TRUTH, valentine's day | Permalink. Good morning Fabulouses! The weekend may be nearly over, but I’m making the most of it enjoying the weather now that it has warmed up enough. Of course it’s not warm enough to melt all of this snow, but at least it’s bearable now! I bundled myself up in the latest group gift by RIR Life, which is the Padded Coat in the sweetest shade of Coral. It comes in several mesh body sizes and has a group join fee of only 10L. RIR Life does really nice monthly group gifts, so your 10L will go super far if you stay in the group. I wasn’t about to head out into this frozen tundra without a good pair of winter boots, and just in time… N-Core put these cute Winter Boots out as a free group gift! They include a texture change HUD with six colours too! I have added the vendor ad below as well because it turns out that most of the detailing is hidden in the snowy grass :/. N-Core has a group join fee of 299L, however there are several group gifts available right now including the three that I blogged recently as listed below. Categories: dollarbie (1L-3L), group gifts, groups, hair, mesh, outerwear, poses, shoes | Tags: 0L free, 0L gift, 1L, Blueberry, Catwa, DeeTaleZ, dollarbie, Dollarbie Pose, dollarbie sl, Entangled, fab free, fabfree, fabulously free in SL, free boots SL, free hair SL, Glam Affair, group gift, Ikon, Love Trill, maitreya, MINA, Mina Hair, n core, North, Rir Life, Second Life, Second Life 0L, Second Life Free, Second Life Freebies, sl, sl free, SL Freebies | Permalink. btw… Who’s your money on? I do appear to have the upper hand currently thanks to this “Smother” pose by Foxcity that I picked up on marketplace for just 1L. Categories: Free, hunts, Marketplace, mesh, pants, poses, sleepwear | Tags: 0L free, 1L, Blueberry, Carson Caiben, Catwa, DeeTaleZ, dollarbie sl, fab free, fabfree, fabulously free in SL, Foxcity, free hunt sl, free in sl, Friday, Glam Affair, Ikon, Love Trill, Magika, maitreya, Marketplace, Peace On Earth Hunt, Penny Lane, POE10, Second Life, second life 1L, sl, sl free, sl hunt | Permalink. We may not be getting Thanksgiving this month in Canada as we celebrated last month, but thankfully… we still get all the good Christmas shopping sales! The photo above is a pretty good real life example of what my office looks like, (minus the delicious plate of Thanksgiving goodies :/). I have been up to my eyeballs in holiday lists, being suckered into so many purchases I hadn’t planned on making. I do have to admit though that this sure beats fighting the crowds for the last tickle me elmo or cabbage patch doll, teddy ruxpin or lego pirate ship or “whatever is the most popular item this year”. This Online Shopper Desk set by Flying Arts comes complete with the desk, animated chair, computer, desk lamp, boxes, wrapping paper and even the plate of turkey dinner. It is 18 prims all together and is available for 1L once you locate the hidden Get Stuffed Hunt icon (which is a cornucopia). The Get Stuffed Hunt runs until the end of the month. Categories: dollarbie (1L-3L), furniture, Home & Garden, hunts, mesh | Tags: dollarbie hunt, dollarbie sl, fab free, fabfree, fabulously free in SL, Flying Arts, Get Stuffed Hunt, hunt 1L, Love Trill, Second Life, Second Life Decor, second life dollarbie, Second Life furniture, second life hunt, sl | Permalink. What’s In Your SL Wallet? Hey FabFree! It’s time to check under those couch cushions and scrape up some all the little lindens you can find because N-Uno has some big sales going on in their Marketplace Store, and when I say sales… I don’t mean 100L, or 75L or even 50L… I MEAN 1L! Infact almost everything is priced at 1L so you can shop for hours on a handful of change! The best way to make your lindens go farther is to skip the single outfits first and go straight for the fatpacks, and then go back to the main marketplace link for other single items that are not sold in fatpacks. Below you will find first a link to the marketplace store, and then below it you will find a link to just the fatpack items, so you can easily skip over the singles and get more bang for your buck. Again.. make sure you check out the whole store though – as some items are only sold in singles. Mama Mia, What A Deal! In my photo above, you will find me wearing three items from the N-Uno Marketplace store that I picked up for 1L each in full fatpacks. The Mia Bodysuit, Skirt and Jacket (animated to keep your arms in!) all come in five standard mesh sizes with alpha layers. Their vendor ad is shown below to give you an idea of fabric textures included. Categories: dollarbie (1L-3L), lingerie, Marketplace, mesh, outerwear, shirt, skirt | Tags: 1L, Catwa, DeeTaleZ, dollarbie, dollarbie sl, fab free, fabfree, fabulously free in SL, FaMESHed, Ikon, Love Trill, maitreya, Marketplace, marketplace dollarbie, N-Uno, Pure Poison, Second Life, sl, TRUTH | Permalink. Hey there FabFree! You won’t believe what happened last night. I can hardly believe it myself! He and I were out for our routine after dinner stroll through the park, my hand in his – like it always is. The air was crisp and cool enough to pink our cheeks and the leaves were crunching below our feet while we talked about the days events. We got to our half way point of the loop at the big old oak tree at precisely 7:00pm, laughing about how things are becoming a bit too routine. Of course this was a comfortable routine and we were both happy with it. A light fog blanketed the ground. The almost full moon offered just enough light for me to see the gravestones past the old rickety gate he was now inviting me to enter through. “Pfft… we shouldn’t be here!” I said “and also.. what has gotten into you?”. He smirked with an I dare you face and motioned for me to walk through the gate saying “ladies first”. I went through that gate of course just to prove I wasn’t scared (even though I was lol). He followed behind me, closing the gate with a clang. He led me up a path to an open coffin. I looked at the coffin with confusion, and then I looked at him… AND HIS FANGS. It’s true everyone…. Carson is a vampire. Get The WHOLE Graveyard Scene for 1L! Hunt down the Horror Hunt (Blood splatter) icon at X-Clusives Animations and buy it for 1L and you’ll have this entire animated scene including everything you see here (except Carson and I). The fog mists, the bats, orbs and ghosts fly and the coffin is VERY animated with cuddles to the x-rated variety. It has a land impact of 66 prims and would be great for photography, or a secret spooky skybox :). 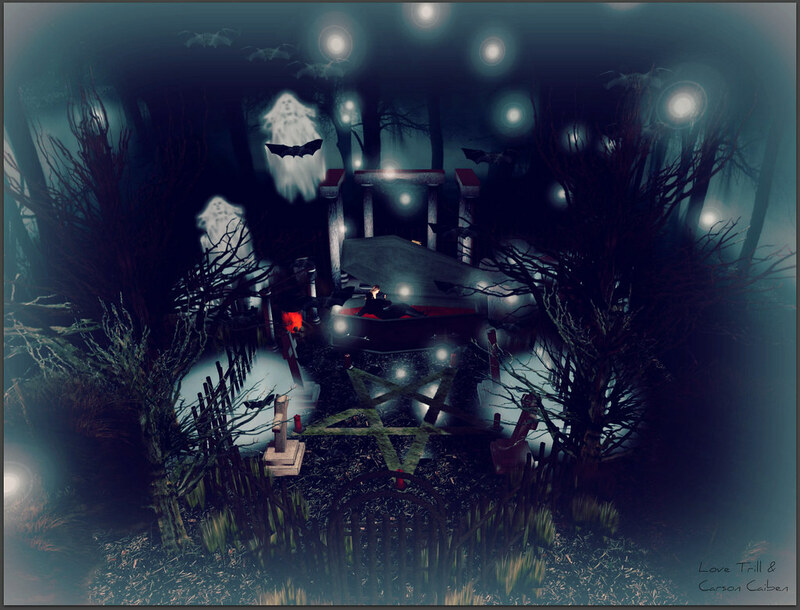 Categories: Animations, dollarbie (1L-3L), Home & Garden, hunts, poses | Tags: 1L, 1L hunt SL, dollarbie sl, fab free, fabfree, fabulously free in SL, halloween SL, Horror Hunt, hunt SL, Second Life, Second Life Halloween, second life hunt, sl, X-Clusives Animations | Permalink. Enough of the jibber jabber! Where did you get that dress? I’m out enjoying the sun today, wearing my new floral mini dress called Lilli that I picked up on Marketplace in the Lamu Fashion store for just 1L! The all over delicate floral print is just lovely on this basic thigh slit / spaghetti strap mini dress. I wanted to show it off on it’s own, but I bet it looks really cute with a denim jacket too. Categories: dollarbie (1L-3L), dress, fitted mesh, Marketplace, mesh | Tags: 1L, Bold & Beauty, Catwa, dollarbie, dollarbie sl, Drunk Panda, Exile, fab free, fabfree, fabulously free in SL, Fifty Linden Friday, FLF, Glam Affair, Ikon, Lamu Fashion, Love Trill, maitreya, Marketplace, Pure Poison, Second Life, second life 1L, sl, UBER, Whimberly | Permalink.